Get the most secure & convenient two-factor authentication plugin for your WordPress website. With SnapID you will never have to remember your username and password ever again and be more secure than ever. All you need to do is send a simple text message to authenticate yourself. Check out this 2 minute video showing how SnapID works. 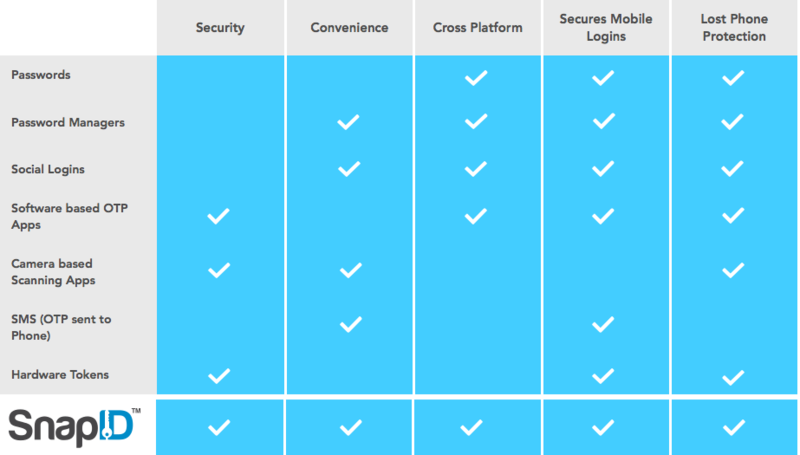 What makes SnapID different from other authentication products? Many websites/companies haven’t taken the appropriate steps to secure their environment because of the complications and expense associated with two-factor authentication. SnapID offers a way for companies of any size to implement authentication quickly and inexpensively. SnapID and TextKey are trademarks of TextPower Inc. TextKey is a patented technology with U.S. Patent number 8,943,561. The WordPress login page with SnapID. SnapID WordPress Plugin installation takes on average just 5 minutes. Login to your WordPress account and go to your Plugins page. Click on Add New and search for SnapID. Download the SnapID plugin and Activate it. We also created a page with full detailed instructions. Check it out here. What is SnapID WordPress plugin? SnapID WordPress plugin is a two-factor authentication plugin that can be installed on any WordPress website in 5 minutes. It allows you and your users to login to your website by simply sending a text message. No more IDs, passwords, password resets, customer support problems with lost IDs. Put a stop to hackers stealing your usernames and passwords and ransoming them. To register your website to use SnapID authentication, follow the instructions here. How do end users sign up to use SnapID on my website? It’s very simple. Provide these instructions to your users. You can use SnapID internationally if you have a Google Voice number. You’ll send a text message using the Google Voice website instead of your phone. These numbers are free and take just a few minutes to set up. If you travel internationally often, we suggest you use a Google Voice Number with SnapID instead of your regular phone number. If you’re a website admin and would like to allow international users to login with SnapID from mobile phones that don’t have US numbers please contact us directly for details. How much does SnapID cost? SnapID is free for all websites that use our plug-n-play softwares/plugins. If you require additional security features, analytics and premium support, please contact us at sales@textpower.com to get started. PIN: When setting up a SnapID account you can choose to activate a PIN that will have to be placed before (prepended) or after (appended) the one-time-password (OTP) that you will text to login to your website. Anyone other than you who has your phone wouldn’t know the PIN and wouldn’t know whether it had to be placed before or after the OTP. It’ll never appear on the screen and therefore anyone else with the phone wouldn’t know what it was, that it had to be sent along with the OTP or what position it had to be in. Delegate: When setting up a SnapID account you can designate a “delegate” that will have the ability to suspend your access privileges by, of course, sending a simple text message to our system. That way when you find the phone between the couch cushions the delegate can send another text to our system reactivating your access privileges. Carrier: If the phone is truly gone – dropped off the side of a boat or stolen – and must be replaced, you will have to tell the carrier so that the particular device is deactivated and your cell phone number is assigned to whatever new device replaces it. When that happens you don’t need to do anything on your end to reactivate the phone with SnapID. The carrier and SnapID will take care of everything in the background. I own or manage multiple WordPress sites. Are there any limits to how many sites I can register? You can text MySnapID to 48510 and it will tell you if you are registered with SnapID or not. If you are registered, you will be told how many applications/websites are linked to your SnapID account. This information is sent to both your registered email and as a reply to your text. You can find the plugin at /wp-content/plugins/snapid. Once you delete the plugin, regular username/password access will be restored immediately. If you don’t have access to your WordPress site using one of the above means, please contact support @ your web hosting company and ask them to delete this folder. One of best kept secrets in Security Period. Arguably, this may be the best security advance the WordPress Log in since the password itself! You set it up to require yourself to text out a number shown on your password screen, rather than receiving one. The system has authenticated your phone when you first set it up in a multiple set of unique ways. SMS is ancient, insecure and proven to be subject to man in the middle attacks, but this turns SMS on its head, using it in an unspoofable way to help secure your website. Am I the only one who knows about this, as I just happened to stumble on it one day looking to boost log in security? Amazing innovation. Great job guys. This plugin is a great option option for anyone who has trouble managing all of the logins for their WordPress sites. Yes, there are solutions like LastPass, but this is way more secure. All you have to do is text a code to the provided number and, voila, you're logged in to your site. No more searching around for usernames and passwords. Try it out yourself! “SnapID Two-Factor Authentication” is open source software. The following people have contributed to this plugin. Translate “SnapID Two-Factor Authentication” into your language. Improvement: Seamless registration from within WordPress. Bug: Fixed reported issue with session. Improvement: Handles changing to new SnapID credentials gracefully. Improvement: Better user messaging and UI. Improvement: Limit SnapID to only run on admin and login pages.